When I saw that 3-D Explorer: Safari Animals had become available, I knew we'd have to take a peek. As suspected, Bookworm1 enjoyed it. (Although, in truth, it still isn't as exciting as the Oceans title.) He liked this new title for much the same reasons though - the 3-D pop-ups which brings life on the African wilderness to life. Open up the page to the Grasslands and giraffes pop up on the page, eating leaves out of trees, while warthogs and ostriches graze below. Just like the other books in this series, this new title is a delight to look at. The information contained in this book is given in easy-to-read paragraphs. 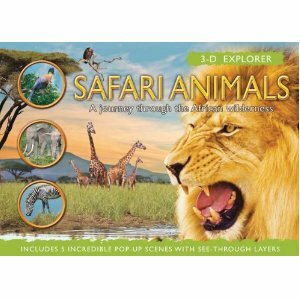 Each 3-D page spread provides a sentence of information about each individual animal which you see. It's not an encyclopedia of knowledge, but rather a novelty book with fun facts to expand the young reader's understanding of different habitats. It is a fun diversion. Thanks to Silver Dolphin Press for providing us a copy to browse through. We surely do appreciate it!